Cocktails have veered on the sweet side the last few decades, sugary to the point of masking the wonderful flavors in the liquor. When exploring cocktails, one of the most interesting components are bitters. On their own, they taste a lot like medicine, not surprising people used to see them that way. In a cocktail, they not only enhance the flavors in the liquor, they create a nice aromatic quality. 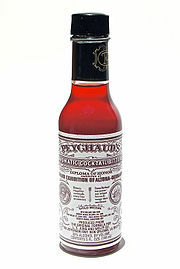 Angostura bitters are probably the most commonly used, first compounded in Venezuela in 1824 as a cure for seasickness. Orange bitters are also commonly used. 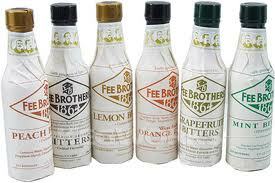 Fee Brothers is a great place to look. I also love their packaging. In addition to the old school bitters, there are artisinal makers popping up. A.B. Smeby Bittering Co. out of Brooklyn has gotten high marks for Diesel Bitters. I also tasted some of Urban Moonshine’s maple bitters from Vermont, thanks to Dan at Pinyon here in Boulder the other night. Still haven’t found any local producers here in Colorado. Anyone know of any? Might be a fun outcome of this to make my own! coat a cold old-Fashioned glass with absinthe. in a mixing glass, crush sugar cube with peychaud’s bitters, add whiskey & stir. pour into glass & garnish with a lemon peel. You are currently reading Bitter at 52 To Do.